NYPD community precinct meetings and various community board committee meetings are held monthly throughout the five boroughs of New York City. These meetings are open to the public. They provide community cat caretakers with a forum to find out about what’s happening in their neighborhoods, and, importantly, to become known and respected by their local authorities. Jane Hoffman, President and Founder of the Mayor’s Alliance for NYC’s Animals, urges community cat caretakers to attend these meetings regularly. “NYPD and local community board members will be much more responsive to constituents they know,” she says. Find your neighborhood NYPD Community Precinct meetings. Community board committee meetings of particular interest for community cat caretakers are the Public Safety Committee (the focus is on law enforcement; issues involving animal cruelty should be addressed here) and the Health and Human Services Committee (The New York City Department of Health, which manages city animal shelters and other issues involving community cats, can be influenced through this committee). Find your local community board meetings. These meetings provide an opportunity not only to gather information but, crucially, during this transitional time with the ASPCA, to help get the NYPD and community leaders up to speed with facts about community cats. Community cat caretakers should strongly consider speaking briefly at these meetings and sharing the following information with community board members, NYPD officers, and other attendees. They can also provide all meeting attendees with a number of handouts, as indicated below. The basic difference between feral cats and stray cats. Put most simply for the uninitiated, feral cats are not socialized to human contact, while stray cats are lost or abandoned housecats. The basics of Trap-Neuter-Return (TNR). Explain that this is the only proven and effective way to control the feral cat population. TNR removes any problem behaviors associated with mating and territory and also controls the size of the colony. In addition, TNR is proven, environmentally safe rodent control. Additionally, explain that each spayed/neutered cat is left-ear-tipped before being returned to its colony in order to provide an immediate visual reference that it has undergone the procedure. The nature of a managed community cat colony. 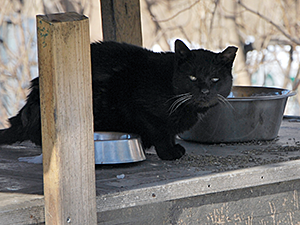 The key word to use and explain is “managed.” As Sheila Massey, a long-time community cat caretaker, has stated at her local meetings, “After TNR, these cats are managed, i.e., fed, sheltered, and monitored. Caretakers know the colony members and their behaviors.” Caretakers know when a cat or cats are missing. Caretakers need to explain to law enforcement officials and community board members that they are reliable sources for reporting potential foul play regarding the cats in their care. TNR is covered by Local Law 59. Bring handouts of this law to the meeting, with the definitions for feral cat (§ 17-802c) and TNR (§ 17-802g) highlighted for easy reference. Local Law 43 contains several amendments to Local Law 59 — you might consider bringing printouts of that law to the meeting, as well. Feral cats are not considered wildlife in New York. All cats, domestic and feral, are considered to be companion animals, protected from animal cruelty by Article 26, Section 353 of the New York State Agriculture & Markets Law. Bring handouts of this law to the meeting. 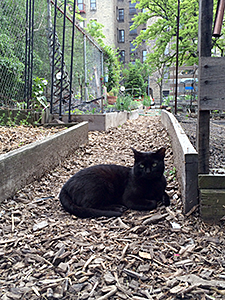 NYCFCI is a resource for community cat caretakers. Explain that the NYCFCI was established to solve NYC’s feral cat overpopulation crisis through TNR, and provides TNR equipment loans, transportation of cats to and from spay/neuter appointments, and more to certified TNR caretakers. NYCFCI also conducts numerous workshops throughout the year and offers advice to the general public. Share their website address: www.NYCFeralCat.org. Hoffman emphasized that it’s important that caretakers who attend these meetings be knowledgeable, brief, and polite in their presentations. Being prepared and articulate at these meetings can go a long way toward building understanding with the NYPD, community board members, and other attendees about the needs of community cats. It is important to not monopolize the meeting and, as a community cat caretaker, to not get carried away by the deep passions that naturally arise when those cats face safety issues. Caretakers might finish up their short presentation by asking community board members or NYPD officers for a follow up meeting with appropriate individuals to delve deeper into the facts and issues surrounding community cats. Caretakers can also consider reaching out to their local City Council members to begin a dialogue about community cats. Find your City Council member. Massey’s experiences are proof that attending community meetings and speaking succinctly and politely about community cats and TNR can pay off. She garnered enough interest about the cats and TNR at meetings that when she extended the invitation to some police officers to come and meet her colony, they accepted. Her continued efforts proved to be instrumental in getting the police to open a case file when it looked like cats in another caretaker’s colony in the community were being poisoned. In addition, the officers who visited Massey’s colony decided to share their new understanding about TNR with the rest of their precinct by writing an article about it for their precinct newsletter. Apparently, that article was read by at least some of their fellow members on the force. According to Massey, when another caretaker in the community was trying to rescue a pregnant community cat that was stuck in a boarded up vacant lot, someone in the neighborhood called the police to report her for trespassing. When the police showed up and understood that the situation was strictly about TNR, they allowed the caretaker to proceed. It actually took the caretaker a few days to trap the cat, and when she did so, she had NYPD officers watching and making sure she wasn’t harassed! This is a great example of how brief, articulate, and polite presentations at community meetings before an issue arises, can benefit the community cats in your care.